As a successful real estate agent, you know how important it is to have a quality real estate website. There are three main reasons why real estate agents need to establish a web presence: to share information about the personalized real estate services they offer, to build a strong real estate brand, and most importantly, to generate leads and bring in business from home buyers searching through Google, Bing, and the other search engines. Our SEO-optimized, responsive and mobile-friendly websites are loaded with interactive real estate marketing features specifically designed to help you attract and convert the highly qualified prospects that are the heart of every successful real estate agent’s business. Your real estate website serves as your introduction to potential customers, so every element on your site should present you and your properties to your best advantage, while showcasing the elements that make your services unique. The free websites offered by brokerages are often cluttered and visually unappealing, built with a “one-size-fits-all” mentality that presents agents as virtually interchangeable cogs in the brokerage’s machine. When you have a stand-alone real estate agent website from For Sale Marketing, you have full ownership of your website. You get a professional, attractive layout that highlights your exceptional qualities and what you have to offer, with an innovative interface that draws in visitors and encourages return visits. Your personalized agent website puts the focus on you rather than on the brokerage firm, allowing you to create a direct connection with potential customers. This helps real estate agents to build a powerful personal brand. Real estate customers don’t just sit at their computers searching for properties and agents – they perform their searches on the go using smartphones and tablets. Many of the free websites that brokerages supply do not include a mobile-friendly version. Once you figure in the price of lost sales from disgruntled mobile customers who go elsewhere for their real estate needs and the value of the missed chances to connect with potential customers, the cost of that free website suddenly becomes prohibitively expensive! All of For Sale Marketing’s easy-to-navigate agent websites are created using responsive web design, so they provide perfect performance on every type of mobile device. Strong search engine performance is the top way that real estate websites generate new leads for agents. With the websites supplied by most brokerages, real estate agents typically have to forward their domain name to their free web page on the broker website. This means that your brokerage-supplied site gets no credit with search engines for your visitor traffic. When you have your own agent website hosted on your own domain name, every visitor that views your page helps to improve its search engine performance. Choose one of our agent website designs, which are search engine optimized on every level, add in the SEO credit from visitors to your site, and your website will start gaining a higher position in search results. Zillow, Trulia, and the other large directory sites routinely capture the top positions for many real estate-related terms, making it extremely difficult for independent real estate agents to establish a strong search presence. Our experienced real estate SEO specialists have in-depth area knowledge that they can leverage to find local and neighborhood real estate terms that larger, centrally-located directory sites overlook. By incorporating these search terms in the ideal frequency throughout your site in page titles, images, copy, and more, For Sale Marketing will help your agent website gain the highest possible position in local real estate search results. At For Sale Marketing, we never lose sight of the ultimate goal of your real estate website: getting the quality leads that will build your business! That’s why we’ve designed lead generating web forms for our agent websites that are specifically crafted to take your visitors through that critical conversion point. Our concise forms contain a short list of tightly targeted questions that will elicit just the info you need, without losing visitors’ interest with long, complicated questions or poorly tabbed navigation. 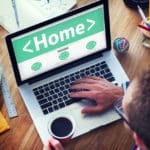 To make sure home buyers and sellers keep coming back to your website, you need a way to show them up to date listings. All of our individual agent websites include a fully integrated IDX solution that allows home buyers to search through MLS listings without having to leave your site. We design all of our real estate agent websites using WordPress as the content management system, so editing content is as easy as writing a Word document. The entire process is so simple to use that any agent will seem like a real estate blogging pro in no time! To help ensure you remain front of mind with your real estate clients, our agent websites include full support for the entire suite of real estate interactive marketing strategies. We include social media sharing buttons and link your site to your social strategies and You-Tube channel, can create custom landing pages for your email marketing strategies, and much more. If you don’t have some of these real estate marketing strategies in place, For Sale Marketing provides full support services as well as monthly marketing packages to help ensure your real estate marketing success.